The American Helix SOLO Chillum / One Hitter Bat though small and portable, features the iconic Helix Venturi technology. 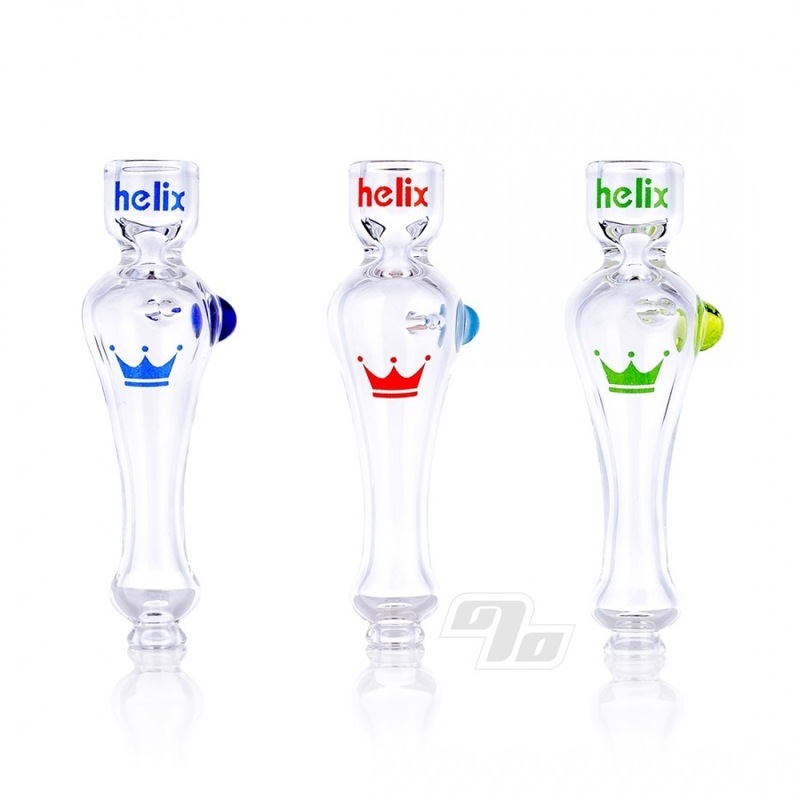 As with all American Helix pieces, the Helix SOLO is 100% American made glass. We wouldn't have it any other way. The American Helix the Original Glass Helix Pipes designed by Boxfan Willy. Each helix pipe is handblown in Texas with the utmost care and precision to make sure each piece meets their impeccably high standards. These pipes are engineered with the scientific foundation of Bernoulli's Principle, demonstrating the Venturi Effect with each and every draw. The Venturi chamber (helix body) utilizes the "trinity" inlet system allowing small amounts of cool air to enter the chamber and mix with the hot smoke to form a swirling tornado effect that quite literally carries a helical shape. Each air inlet is precisely made so that there is neither an excess or deficiency of air flow introduced from any point in the "trinity." Accent colors vary so let us know if you have any preferences. High quality American blown glass! Thick enough to take bumps & bruises & hits great! 5 stars for sure! The helix action works pretty well too! Just got it yesterday. Bowl is a bit larger than I expected. Still love it. Great smoking. Love how smooth the pipe hits with the air carbs! If your looking for a great chillum with the Helix technology then look no further. This bat hits like a champ and the smoke stays cool the whole time. You can expect the great quality of a Helix piece and the best part all these pieces are blown in the USA.